This post will explore why all turnover is not created equal. Measuring sales turnover as a percentage can be misleading. A lower percentage isn’t always better. Yet turnover is probably the most measured sales metric. HR, sales leaders, and Sales o ps all measure it. Instead of focusing on an overall turnover percentage, focus on retaining ‘A’ players. Many sales organizations are proud that they have a low turnover metric. But they are retaining the wrong people. Want to retain 100% of your 'A' players? Download the Top 10 Ways to Prevent ‘A’ Player Turnover Checklist. Print it out and put it on your desk. Todd has exceeded quota the past 5 years. His quota is approximately the same as everyone else. Yet he has 3x the average territory potential in his patch. He has some of the largest current customers. Prospects fall into his lap with little effort. His boss does not want to split his territory. Why mess with a good thing? Todd hasn’t needed to be a student of the game. He has made boatloads of cash and played golf on Friday afternoon for years. Why spend time sharpening the saw? Because of this, Todd isn’t extremely competent on relevant sales skills. Is Todd an 'A' Player? Many would think so based solely on his results. But place him in an equal territory and watch him flounder. Ned has been on your team for 9 months. He impressed everyone during the hiring process. He was diligent during onboarding. His activity is through the roof. He is teaching others of the team new skills he learned in previous roles. Yet, Ned’s results are average for his tenure group. Ned was given the smallest territory and worst customers. Why? His Sales Manager didn’t want to rock the boat. He doesn’t feel Ned knows the product or industry well enough to approach large customers. He is holding Ned back. Ned walks into the Sales Manager’s office and resigns. The Sales Manager looks at Ned's revenue numbers and doesn’t bat an eye. Once Ned is gone, the Sales Managers labels Ned a ‘bad hire’. What would have happened if Ned was given Todd’s territory? Odds are, his revenue would have skyrocketed. He possesses better hunter competencies and works much harder. In the long run Ned would have significantly out produced Todd. But the Sales Manager was focused on the next 30 days. The Sales Manager in this scenario missed his number by 4% last year. If he gave Ned a fighting chance he would have hit the number. Backfilling Ned’s territory led to a $1.2 million year-over-year territory revenue deficit. That revenue would have bridged the gap. This is a common issue. So how do you solve it? 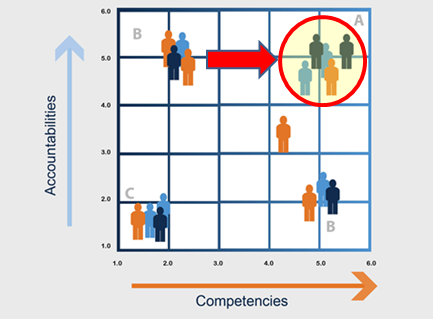 Identify ‘A’ Players - determine your team’s level of competency. Add in performance against accountabilities and plot your team on the 'A' player matrix. Assess whether your performance conditions are conducive to 'A' player success. Territory & Quota – do 'A' players have a fair shot to hit their number? Leads – are you providing them enough quality leads? Is your Go-to-Market Strategy relevant – dated sales channels will frustrate customers. Frustrated customers lead to frustrated A players. Reduce non-selling time – admin doesn’t make any sales person money. Minimize it! Comp – are 'A' players paid fairly for their efforts? Execute the 10 Sales Leadership Ideas in the tool - ‘A’ players won’t settle for an average leader. They need a boss that will remove obstacles, provide candid feedback, and challenge them. ‘A’ players want value from their boss, not noise. Nothing will lead to ‘A’ player turnover faster than poor sales leadership.